Before the Nationwide race at Bristol even started, the drama began. It was reported that the No. 79 of Jennifer Jo Cobb had gone behind the wall. 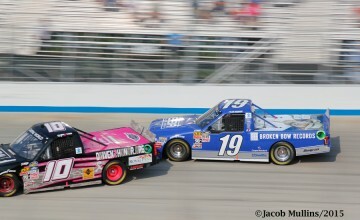 Recently giving up her Truck seat to run for the Nationwide Championship, it was unknown why. Soon details came out it was for a driver change. At first it was reported that Charles Lewandoski would be behind the wheel but Chris Lawson was actually the driver who had suited up. Shortly after the green flag fell ESPN caught up with Cobb, who said her owner, Rick Russell, told her she needed to start-and-park. On top of that, Cobb said she heard rumors she was going to pulled out of the car at California. Taking a stand against being a start-and-parker, Cobb climbed out of the car. Eventually the No. 79 car ran five laps (according to nascar.com scoring) with Lawson behind the wheel. 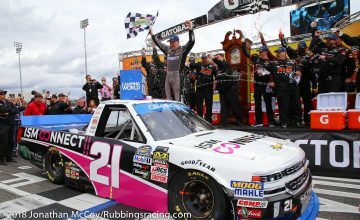 Cobb’s crew chief, Steve Kuykendall, tweeted that he and Cobb have parted ways with Russell and 2nd Chance Motorsports. We will keep you updated as the information comes in. Dustin Long of HamptonRoads.com caught up with 2nd Chance Motorsports’ owner Rick Russell to get his side of the story. Russell’s story conflicts with the one that Jo Cobb explained. In the same interview with Long, Russell would go on to say that Jo Cobb’s actions made himself and the entire sport in general look ludicrous. Jennifer Jo deserves better than what she got. The way owner Rick Russell treated her was and is underhanded and not befitting of NASCAR or the Nationwide Series. Jennifer Jo made a commitment to drive and she should have been given the chance to do so. Jennifer Jo Cobb is more of a story than Danica Patrick. Instead of all the focus on the no. 7 driver, Alan Bestwick and the rest of the commentators doing the color should do more research and share the stories of the other drivers that have come from the small tracks to rise to the level of NNWS ans NSCS. I applaud and support Jennifer Jo for the stand she took. Jennifer Jo has earned my respect for what she did. I will keep good thoughts for Jennifer Jo and hope that another team and car owner sees her potential and picks Jennifer Jo up as a full time driver. God bless. What Jennifer Jo Cobb did was try to hijack a race team. She said herself there were “rumblings” all week about Start & Park which, if you read between the obvious lines, means she KNEW they were going to start and park. There is no denial to the friday meeting Rick had with the team, and start & park was the order of business, a good idea considering Jen Cobb’s experience with Bristol and the VERY high chance the car gets mashed or she wads it up. She got with her personal crew chief and devised a plan to get crew, buy tires and to try & run the entire race, not giving a damn about the wishes of the car owner. When she was told no, you are going to start and park, she made a mockery of the whole deal and left. Regardless of what you think about Start & Park teams, they have an owner…and no team owner should stand by while his team gets hijacked by a driver and their hired guns.